Ships in 3 to 4 business days. Sizes are 20x25x4, 16x25x4, and 20x20x4. 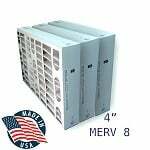 The FiltersFast 4-inch MERV 8 Air Filters, 3-pack have a MERV 8 rating and can be used in a variety of applications including residential and commercial. 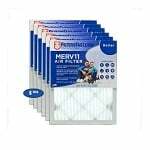 MERV, or Minimum Efficiency Reporting Value, indicates when a filter will be least efficient. So the higher the MERV rating, the more efficient the filter. It should be noted that most fiberglass spun filters such as those found in your local grocery store are usually only a MERV 1 or MERV 2. This can affect the efficiency and air flow of your heating and cooling system, causing it to work harder to produce the same air flow and costing you more money! FiltersFast Air Filters are an economical alternative if you're looking for a quality air filter without paying a premium price! 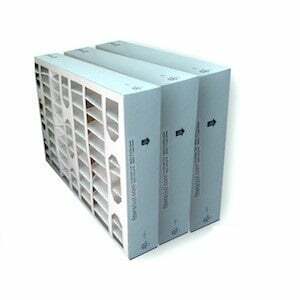 FiltersFast four inch air filters contain 8 pleats per linear foot which creates a greater surface area to catch airborne particles. 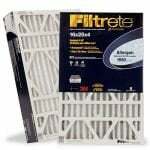 These air filters should be changed every 3 months for optimum performance. The chart below will show you what you can remove with a MERV 13 air filter, a MERV 11 air filter, or a MERV 8 air filter.